"When just getting even is not enough!" Shiro Tanaka (Sho) is a Phoenix, Arizona cop working for the “Drug Investigation Bureau”. Both he and his partner Ray (Wiley) are sick of department red tape, and even though they always get results, the top brass is always coming down on them for their “reckless” ways. While working an angle, Ray goes solo to the compound of the sadistic drug lord Havelock (Van Bergen), where he is then tortured and killed. Shiro vows revenge and uses every weapon at his disposal to stop his arch-nemesis, and eventually this leads them both into the jungles of Argentina where the final battle commences. Will the resourceful Shiro win the day? Starting from the opening “party boat” scene, you know you’re in for a heavy dose of 80’s awesomeness. (frustratingly, the one song used in the film, a Wang Chung/Mister Mister-like jaunt, is not listed in the credits or anywhere online that we could find). Both here and throughout the whole film, Sho’s thick accent is in full force. Some of the most hilarious moments in the movie come during the dialogue scenes, where the other actors have to simply pretend his accent isn’t unintelligible. So, to keep Sho’s dialogue to a minimum, he pauses instead of speaks in many cases. The result is amusing. But the other actors aren’t blameless here either - while Sho’s name in the movie is “Shiro”, it sounds like most people are calling him “Churro”. While this would be insulting to Mexicans and Japanese alike, I think we can put this down to lack of understanding of Japanese naming traditions. While this is part and parcel of the whole Sho experience, fans really want to see Sho in action, and they are treated to some great stuff here. 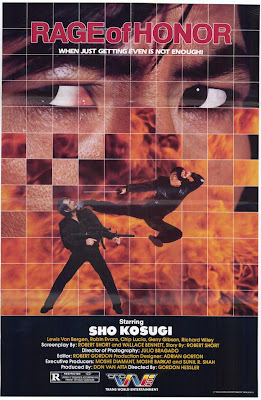 While the film lacks one of Sho’s trademark opening-credits displays of his moves, we do see throughout the movie his wide array of weaponry. Some of which he is credited with creating himself. While the bad guys have some noteworthy hardware, such as long , Wolverine-like metal claws that remind you of Terror Claws Skeletor, in almost every action scene, Sho seems to have a tackle box filled with throwing stars, nunchuks, swords, grappling hooks and many other items. One of the coolest is a digital throwing star which blows up on contact. It doesn’t get any more awesome than that. But, if truth must be told, there is some filler in this one. This is director Gordon Hessler's immediate follow-up to Pray for Death (1985), which is a much more consistent film. Yes, Havelock is the classic “hiss-able” bad guy, but Limehouse Willie beats him in both the name and pure evilness departments. Once the action moves to Argentina, it gets dangerously close to a standard Exploding Hut jungle slog, and Sho can do better. We liked him in the scenes with his tuxedo and white scarf, looking suave. Despite what may surround him, one fact is undeniable: Sho is cool. Interestingly, while Sho is, here, for all intents and purposes, a ninja, the whole “ninja” aspect is not played up at all. No one says the word “ninja” and no emphasis is put there. Perhaps by 1987 the filmmakers felt the whole Ninja Boom was on the wane and they would try out Sho as a cop...who’s basically a ninja. So go back to a time when men smoked in hotel lobbies (and the prerequisite abandoned warehouses), and Sho ruled the video store shelves. 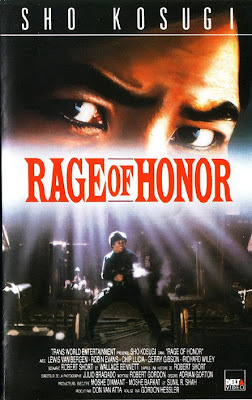 While we believe the best Sho movie we’ve seen to date is Pray for Death, the Cannon-like fun of Rage of Honor shouldn’t be forgotten among those who can’t get enough of the thrills of Sho. I agree completely Pray for death is Sho's best but I do remember loving this one too, it brings back some real memories! It definitely has some good moments especially towards the end with all of Sho's weapons! Revenge of the Ninja. That's all. 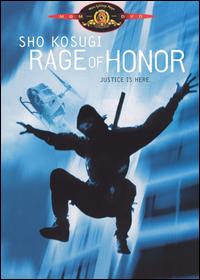 Revenge Of The Ninja is one of Sho's best flicks! Rage Of Honor could have been better. I somehow haven't seen or reviewed this one yet. I had it on my to watch list a long time ago, and went to my archives to see what I thought, thinking I had seen it and posted on it before, and realized the frightening truth! I should rectify that soon, at least for the Kosugi factor. It is definitely worth watching for the Sho factor! The song that was featured in Rage of Honor has been uploaded to YouTube, for anyone who's been looking for it. The uploader labeled the video "Rage of Honor Soundtrack-I Was Gonna Be Good to You". Cool! Thanks for the info about the song. We appreciate it.